One of the many activists in the current #OscarsSoWhite controversy is the Smith dynasty, namely Hollywood supercouple Will and Jada Pinkett Smith who have publically declared that they will not be attending this year’s ceremony in protest to the lack of diverse talent amongst the nominees. Entirely understandable though their stance may be, some have pointed out the possibility that they are doing this solely because the former was not recognised in the Best Actor category for Concussion, despite earning a Golden Globe nomination and a handful of other nods. Like many of the shunned actors and filmmakers of colour this year, the Smiths have wildly cited their very race as a reason why the majorly-white Academy hasn’t recognised them. However – although, just to make things absolutely clear, we highly support a more inclusive and diverse industry, and not just within the Academy – we tend to think of ourselves as colour blind and analyse the very merits of the performance itself, skin colour playing little to no part in our thinking whatsoever. With that said, it’s very possible that the Academy overlooked Will Smith this year because, very frankly, it’s not a very good performance. It’s by no means awful or even bad, but Smith – as Nigerian doctor Bennet Omalu, who discovered an alarming pattern of brain damage in deceased NFL football players and had to fight the corporation for his voice to be heard – is on incredibly self-aware form here, giving the type of Oscar-baity performance that some are accusing Leonardo DiCaprio of giving in The Revenant. His distracting Nigerian accent aside, Smith dials down his usual charisma to a fault, not quite After Earth but think more Seven Pounds and you’re on the right track. Like that film, it’s clear that Smith so desperately wants that golden statue this year and you can see that’s what’s driving his performance more than anything, so it’s hard to buy scenes of him going into full detail about his medical findings because it sounds heavily rehearsed and dramatized instead of actually sounding like a real conversation. This is a very self-aware performance that Smith gives, and unfortunately in this instance, at least in our opinion, it hasn’t worked in his favour, and while it’s far from a terrible performance it is by no means anywhere near the best he’s ever done. Working off an exposition-heavy script and snail’s pace direction, both provided by Peter Landesman, probably didn’t help Smith’s chances either. On paper, it definitely sounds like it could be an interesting anti-corporation drama-thriller if done right, but Landesman leans way too heavily on the melodrama to make it work as a drama, and is far too concerned about the facts rather than the actual emotional connection to make it even thrilling. We never get an understanding of why the situation is of any importance to these people, when there more than likely was in real life, nor why it even screams to be told as a narrative film; odds are that this would have probably played much better as a documentary, which are sometimes more powerful and emotional than their fictional counterparts, but as a narrative it doesn’t seem to do the intriguing real-life story justice. The pacing is far too slow, and it’s only around the 30-45 minute mark that Omalu seems to actually discover the patterns of brain damage; beforehand, and afterward, we’re treated to long, drawn-out scenes of people talking without ever giving us a reason to care about anything. A sub-plot, for instance, sees Omalu develop a relationship with his Kenyan future wife Prema Mutiso (Gugu Mbatha-Raw), but neither actor shares a strong chemistry with each other or any actual humanising dialogue between them, and when they do it can be very awkward and even robotic at times. You know an attempt at an on-screen romance between the likes of Will Smith and Gugu Mbatha-Raw has failed when Smith actually has more on-screen chemistry with a balding Albert Brooks (who’s the best part of the movie, incidentally). 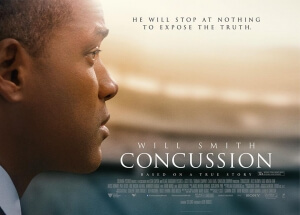 When you really start to look at it, you start to come to the conclusion that, despite what activists might want to believe, both Will Smith and the movie Concussion were not overlooked based on racial prejudice – it just wasn’t a very good movie or performance to begin with. It’s a sad truth, one that the easily riled-up Internet might choose to ignore in the midst of this #OscarsSoWhite campaign, but it’s worth knowing nonetheless. Concussion is an unengaging and mostly lifeless account of real-life events, with Will Smith turning in a distractingly self-aware Oscar-baiting performance that isn’t helped by a dull script and slow-paced direction.